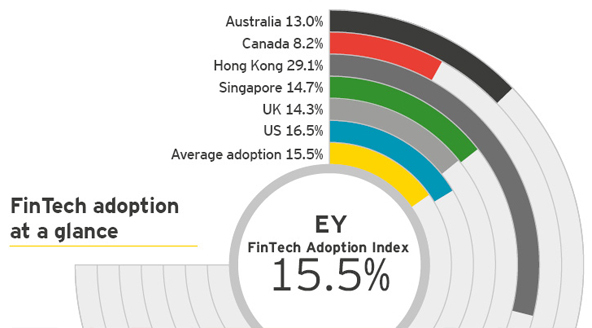 Ernst & Young have now released their ‘EY Fintech Adoption Index’ which outlines how quickly the market is taking up FinTech products. While we are a market leader in the adoption of credit card contactless payment technologies we are slow to take up FinTech products. As our market matures this is sure to change. Driven by innovative startups and major technology players, the booming FinTech industry is capturing traditional market share by offering customers easy-to-use and compelling products and services. We surveyed more than 10,000 digitally active people in Australia, Canada, Hong Kong, Singapore, the United Kingdom and the United States to better understand the overall rate of FinTech adoption, which users are adopting which products and the outlook for future usage. FinTechs are moving in on the traditional financial services landscape and their products and services are catching on. For traditional financial services companies, including banks, insurers and wealth and asset management companies, the risk of disruption is real. Our survey shows that 15.5% of digitally active consumers have used at least two FinTech products within the last six months. As awareness of the available products and services increases, adoption rates could double within the year. Hong Kong has the highest rate of FinTech use of all markets surveyed (29.1%). The United States has the second-highest adoption rate (16.5%), followed by Singapore (14.7%), the United Kingdom (14.3%), Australia (13%) and Canada (8.2%).